Just Like Having Your Own Teeth! Do you find yourself avoiding laughing or eating in public because you have one or more missing teeth? Would you like to avoid wearing dentures? Or are you unhappy with your current full or partial dentures? Has tooth loss robbed you of confidence in public? Then talk to Dr. David Mondock about whether dental implants are for you! 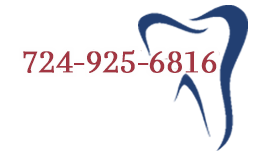 We are only a phone call away at 724-925-6816. When people talk about dental implants, they're really talking about a two-part device: the implant and the artificial tooth. The dental implant replaces the root of your tooth, providing a stable foundation for the artificial tooth. The implant is usually made out of titanium, a metal that is easily accepted by the body, so rejection is unlikely. The artificial tooth (also called a prosthesis) looks just like a natural tooth. In fact, if your actual teeth have metal crowns or visible fillings, artificial teeth may actually look better and more natural than the real ones! An added bonus of implants is that they help keep your jaw healthy by stimulating new bone growth. 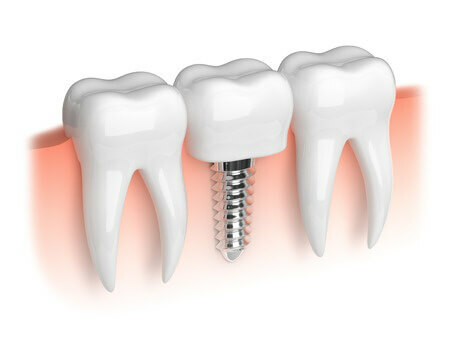 Dental implants are a marvelous solution to the gaps in your smile, but they are not a quick fix. Placing the implants is a surgical procedure that involves anchoring the implants into the jawbone. When your jawbone has healed around the implants (usually three to six months after the first step), a second surgery attaches abutments that will join the implants to the artificial teeth. When your teeth have healed around the abutments, an artificial tooth is created. Great care is taken over several visits to make certain your new teeth will provide you with a stable, pain-free bite. Contact Dr. David Mondock today at 724-925-6816 to make an appointment to discuss whether dental implants are for you. After a careful assessment of your needs and overall health, he'll give you good solid advice. Even if implants aren't the solution for the gaps in your smile, he can discuss others, including bridges, or full or partial dentures. Remember, you can also use our easy Contact Form! Don't delay! Dr. Mondock can put you on the way to a stronger, brighter, healthier smile!